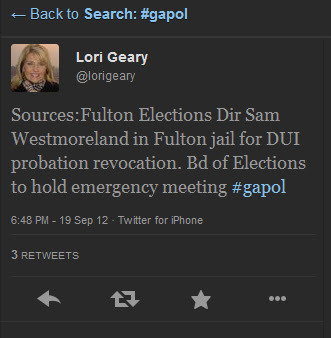 WSB-TV political reporter Lori Geary broke this story on Twitter at 6:48PM Wednesday evening. 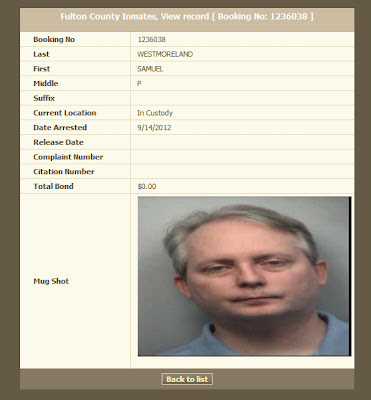 A quick check of the Fulton County jail's active inmate list shows that former Fulton County Democratic Party chairman Sam Westmoreland is currently incarcerated and charged with DUI. Pictured right is the mugshot of Westmoreland, who currently serves as director for the Fulton County Department of Registration and Elections. Westmoreland has been in the Fulton County jail since September 14th.